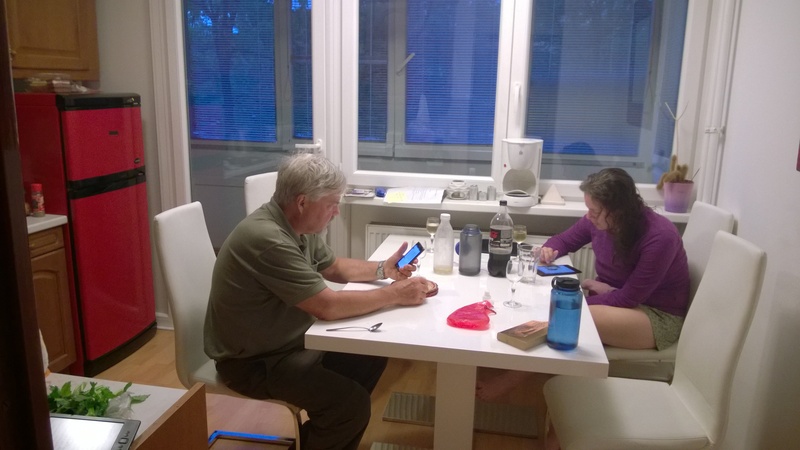 This is a guest post by Peggy, Della’s mom, who joined us, along with Wayne, for 14 days in Slovenia, Croatia, and Bosnia Herzegovina. After picking up our rental car, we were off on our rather short drive to Slovenia. 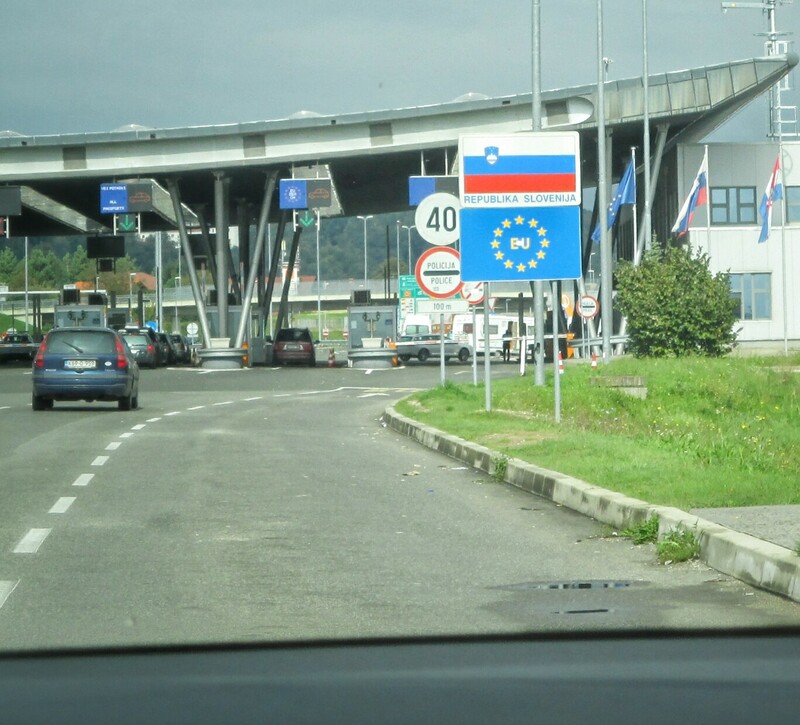 It was an easy border crossing, but you do have to stop to buy a sticker that allows you to drive on the Slovenian toll roads – good for a week. Entering Slovenia from Croatia. You stop right through the booths on the right and buy your sticker from a little van. It took 1.5 hours to Ljubljana. 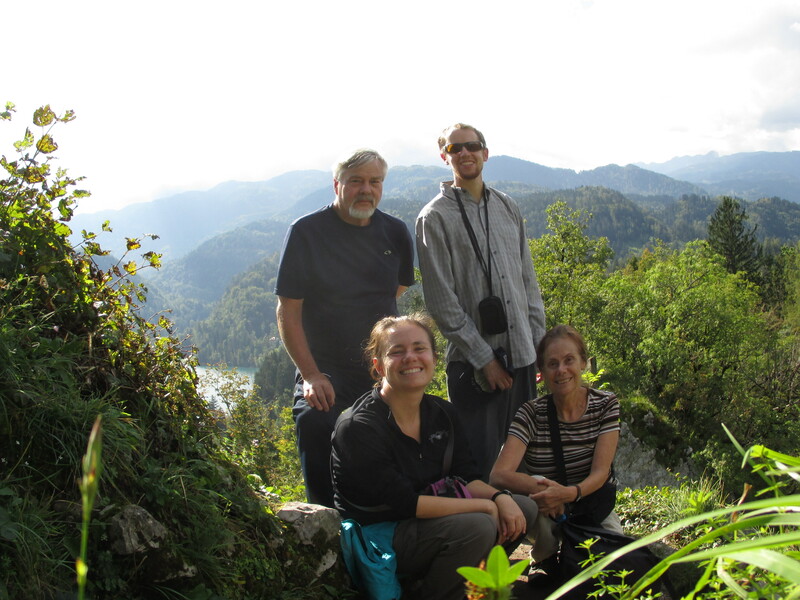 After a quick stop at our AirBnB apartment, we quickly drove on to Lake Bled, another 45 minutes. This is Slovenia’s premier resort area. It reminded us a lot of Lake Tahoe. What distinguishes it is a small island near one end with a pretty church and a huge castle on top of a cliff at the other end. We walked fully around the lake (it isn’t as big as Tahoe) and climbed to the castle for grand views. We also stopped for a great cream cake pastry, a specialty of the area. We were grateful that morning rain gave way to partial sun in the afternoon and mad that we left our bathing suits with our luggage in Ljubljana. Stopped for a quick bite. Yum. SO FRUSTRATED that one of the only pictures of all four of us was accidently taken with fish eye effect…. fail!! We had an apartment with a big kitchen so we opted to cook our own meals both nights. We were happy to find a vinotoc, a place where you go to fill your own bottles from the wine barrel. Day 2 was spent in Ljubljana. We did a “free” walking tour. About 50 people showed up at Preseren square and they split us into 2 groups. Our guide Neja was quite good. The old town spans the river and there are multiple bridges each with its own character, the triple bridge, the dragon bridge, the cobblers bridge, and the new butchers bridge with cool glass walkways. One highlight was the new bronze door on the cathedral, commemorating a visit by Pope John Paul. Its depiction of Slovene history was interesting, as were the explanations of recent Yugoslav history provided by the guide. After the walking tour we went on our own to a different part of old town to see the Serbian orthodox church, passing the US embassy in a neat old building en route. Ljubljana is a pretty city, greatly influenced by an architect named Plecnik. We had really hoped to see his house/museum but this time our guidebook was unfortunately correct when it noted it was closed for renovation. On day 3 we drove about 1.5 hours to the karst region to visit UNESCO world heritage site Skocjan caves. The area is mostly limestone which is soft and porous. There are two parts to the cave, a silent dry part with really large caverns. There are some interesting rock formations but nothing as interesting as say Carlsbad Caverns. The second part is an active cave with a huge river running through immense caverns. Definitely class 6 rapids. This part was interesting and pretty unique as you cross over the rushing river on a high bridge which affords stunning views of the cavern. When you exit the cave, you walk perhaps another mile through an area which used to be cave but where the Limestone roof grew thin and collapsed. So its now kind of like a lushly vegetated caldera with a river canyon. Annoyingly… there were no pictures allowed in the cave. This is a picture of a picture on a brochure of the most unique part of the cave. Doline- where there was once a cave which then caved in. Now it is a big canyon type thing. You can explore after you leave the cave. After leaving Skocjan, we headed back to Croatia.